Fifty-six billboards with positive messages aiming to spread joy, optimism and inspiration are popping up this week in 41 cities across the U.S. The billboards are part of Smile Across America, a national campaign from The Joy Team (a positive thought non-profit based in Vancouver, WA) and Natural Life (an artisan retailer of happy treasures based in Ponte Vedra Beach, FL) to help Americans celebrate and rekindle their inner joy in honor of International Day of Happiness on March 20th. "One positive message can make a huge difference in someone’s day," said Michele McKeag Larsen, founder of The Joy Team. "Our affirmative billboards have inspired people, made them smile, helped them celebrate birthdays and deal with cancer, memorialized loved ones and even saved a life at least once. Imagine what 56 of them across the U.S. can do." 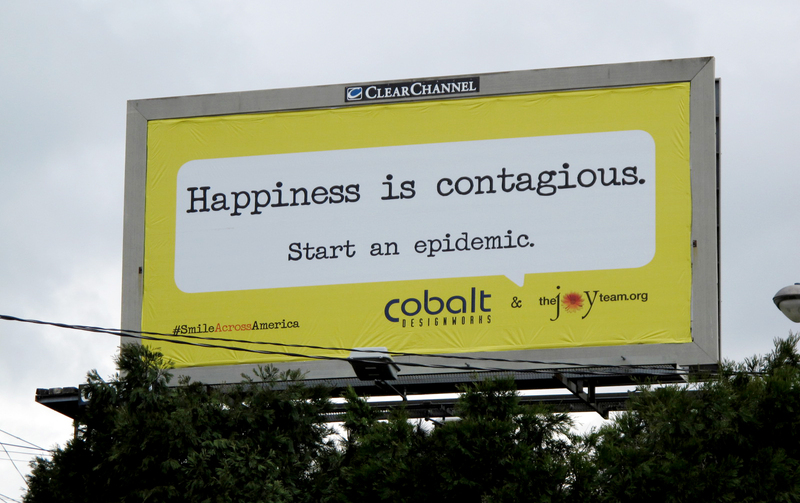 56 billboards are going up in 41 cities the week of March 14th and every one of them will be up in time for International Day of Happiness, a day created by the United Nations in 2012 to recognize the relevance of happiness and well-being as universal human goals. The billboards will be up for four weeks and garner roughly 17 million impressions (ie: smiles) while they're up. Pdf's of each message are available at SmileAcrossAmerica.com so anyone can download them and post them in their windows to spread joy, optimism and inspiration right where they are. The Joy Team worked with Clear Channel Outdoor, Lamar Outdoor and Billups for billboards space. "The moment we saw the billboards and story behind The Joy Team we knew we wanted to be part of it," said Patti Hughes, Founder/CEO/Creative Officer of Natural Life. "We love to make the world a better place and inspire people to live happy. We, too, believe that words can change the world. One kind word can change someone’s entire day!" "Think happy. Be happy." "Something wonderful is about to happen." "Stop. Smile. Breathe. Life is beautiful." "You make a difference." "Do more of what makes you happy." These are just some of the messages that will inspire and uplift people across the nation. A complete list of the smile cities and pdfs of the positive messages can be found at SmileAcrossAmerica.com. Positive messages influence our thoughts. Our thoughts affect our beliefs, the words we speak and the actions we take; which shape the circumstances and events of our lives. Happier, more optimistic thoughts lead to happier, more optimistic people. Why does happiness matter? Not only does research show the health benefits are huge; but it also shows happiness leads to success in nearly every domain of our lives; including marriage, friendship, community involvement, creativity and, in particular, our jobs, careers and businesses. Billboard advertising works. You can't turn it off, fast forward it or mute it. If you drive by it, you see it. Most people can't help reading something they see, it's automatic. Want to share a happy thought? A billboard is an excellent way to do it. Founded in February 2010, The Joy Team is a 501c3 corporation based in Vancouver, Washington, with the mission of building community by spreading joy, optimism and inspiration. Projects of the positive thought organization include putting up 273 positive messages (and counting) on billboards, delivering over 2,450 Happy Packets to the staff of organizations serving the community through The Junior Joy Team, giving over 4,400 jars of joy-wrapped peanut butter to hungry kids through the PB & JOY Project and the annual international Chalk the Walks event. Learn more at thejoyteam.org, like them on Facebook.com/TheJoyTeam or follow them on Twitter @TheJoyTeam. Natural Life makes irresistible treasures with a free-spirit style and positive vibe…inspiring people to Give and Live Happy! We believe that it’s the little things that mean the most, that kindness really does matter, that you should always be yourself, do what you love, and try to make the world a better place! It was founded by Patti Hughes in 1996 fueled by everyday life with three daughters, nostalgic memories and global artisan markets! The Natural Life brand can be found in retail stores all over the world, online and its Flagship Store at the St. Johns Town Center in Jacksonville, FL. The Natural Life store and online community have become a destination where people come to share stories and inspiration, enjoy the little things and discover Natural Life treasures for themselves and their loved ones. For more information about Natural Life, visit: www.naturallife.com and connect at facebook.com/naturallifegifts and @naturallife on Instagram. The Joy Team is a non-profit corporation with the mission of spreading joy, optimism and inspiration. Since 2010, they've put 273 (& counting) positive messages on billboards; effectively placing 100 million seeds of joy out into the world. Just one day after Portland, Ore., Police experience intense protests, skirmishes and disorderly conduct, their counterparts across the river in Vancouver, Wash., will be showered with Happy Packets by local elementary school kids.